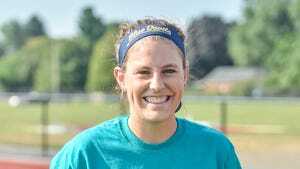 During Rachel Dusman's first two years on the Chambersburg field hockey team, she lacked confidence. She played with caution, but also had big aspirations to play field hockey in college. That's a combination that does not mix. So after her sophomore season with the Trojans, Dusman knew she had to change something. She began focusing on field hockey as a full-time job. She competed at the club level, and in college showcases. She constantly had a stick in her hand, doing more than 200 pulls a night, and worked on skills in her living room. Thankfully for Dusman - and the breakables in her house - her stick skills improved, she morphed into a strong, confident player, and became an asset to the Chambersburg field hockey program. She is the Public Opinion Field Hockey Player of the Year. "In the beginning I think I was a little bit more timid and I was kind of scared to get the ball," Dusman said. "Last year I used to just get rid of the ball, but this year I felt that I could get past the people I didn't get past last year. Last year I knew I really needed to improve if I wanted to play in college, so playing all offseason definitely helps." 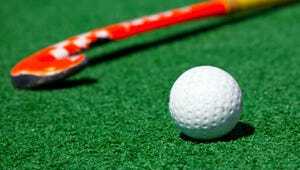 It started with a suggestion from Chambersburg coach Jen Amsley, who told Dusman that working on pulls each night will improve her stick work and help her get around defenders on the field. "I was kind of like, 'I don't really know,' but I listened to her and it's crazy how much it helps me," Dusman said. "I started about a week after our season ended last year and I've been doing it ever since." "Last year she didn't have as much confidence in herself, but she gained it over the summer," Amsley said. "Rachel is a very talented young lady and she has worked hard since the day she stepped on the field to play for me. I know she is where she is at today because she has worked so hard in the offseason." Her improvement in both technical skills and her confidence on the field radiates when she plays. Your eyes drift to Dusman not only because of her bright orange headband, but because of her fierce competitiveness and skill, which helped the Chamberbsurg field hockey team achieve it's most successful season since 2008 with a 9-7-1 record. She finished the season second on the team in scoring with five goals and six assists, second only to last year's P.O. Player of the Year, Liza Ernst, who had nine goals and four assists. "She is one that has incredible ball control, incredible speed, and incredible aggression in a good way," Greencastle-Antrim coach Becca Rice said. "A lot of girls on my team respect her. They all know her, talk about her and her skill level, and the things she did to contribute to her team." "This year we knew if we wanted to get something done, this was the year, so being able to accomplish that goal from 2008 to now was pretty great," Dusman said. " Next year we will have to start from scratch, so I'm thankful for the seniors this year. I looked up to (the senior captains) and I learned from them for next season. They helped me learn how to take over next year and I'm really glad because I don't know if I could do with without them." When asked about which game stuck out to most in her mind, Dusman quickly said the team's second matchup with Mifflin County, in the last game of the season, which the Trojans won 3-2. Amsley, however, had a hard time picking just one game that Dusman was a standout player. State College, Mifflin County, Cumberland Valley, Carlisle - the list went on an on, proving what an asset Dusman was to the team in divisional play. "I would tell her something that I need her to do (during a game), and she does it," Amsley said. "Often I would give her a challenge, to take it end to end, or beat this person, perform a particular move, and she would do it. She was trying to get better every single game. She gave what she had every game and she's definitely a team player." Next year Chambersburg will look totally different, with a new head coach and the loss of five senior starters who were the heart of the team's success this year. But thankfully for the Trojans, Dusman will be back for one more year. Other interests: She also plays lacrosse and plays for the Central Penn Elite club field hockey team ... She is a member of the Key Club and the National Honor Society. Ritual: Dusman wears the same orange headband every game. Surprising fact: Throughout her athletic career Dusman has played six sports and has a black belt in karate. Statistics: Dusman was second on the team in scoring with five goals and six assists, and was a threat for the team as a defensive mid ... She was selected as a Mid Penn Commonwealth Division first-team all-star ... Dusman was a top-12 scorer between Franklin and Fulton counties and was top seven in Franklin County.